Without looking, Mitch ran the palm of his hand over the subtle bottom contours of my grey single fin longboard. He said nothing but raised a small smile. He had shaped the board for me six months previously at his home on the Sunshine Coast of Australia and was about to take it out for his first ever surf in the UK. Mitch riding the nose as only someone of his standard and skill can do. It was clear to me that Mitch Surman, the creator of the board, the architect of the deep concave in the nose and the radical up turned rails, was rekindling his relationship with it. He was reaching back into his own mind to understand the board better than anyone else could. The process was neither long nor dramatic, but it was one that only Mitch, the board’s father, could perform. At the age of 17, Mitch was competing on the ASP World Longboard Tour travelling to Hawaii, Sri Lanka, and other destinations around the world chasing the dream of competitive success and a living in surfing. After a couple of years without a major result and being let down financially by his sponsors, he took a step back from surfing and focused on carpentry as his future career. But, after six months, he ached for a return to the surfing fold and so founded MS Surfboards, his independent shaping label. His shaping had brought him to Portugal to make a selection of boards in Figueira da Foz and now to west Cornwall. Whilst Mitch was pulling on his wetsuit, Sarah Bentley arrived, as did Elsie Pinnegar of Neon Wetsuits who was bearing a delicious raspberry and almond cake. Steve ‘Badger’ Coombes screwed the last bolt into his water housing and held it to his face, peering through the view finder. He stuck a plaster over the sea ulcer on his foot – caused by the continual friction of swim fin on soft skin. Five years ago, Badger moved from Bournemouth to Falmouth to study photography and has since lived in and around West Penwith working in bike shops and surf schools and jumping in the sea to shoot pictures at any opportunity. His energy is boundless, and he relishes the physical challenge. His surroundings are his friend, elements to incorporate into his photography rather than overcome. Samuel Glazebrook zipped up his bulging rucksack and heaved it onto his back; a wetsuit hanging from one strap, a pair of swim fins from the other. Over one shoulder rested a tripod connected to a camera with a giant white lens. 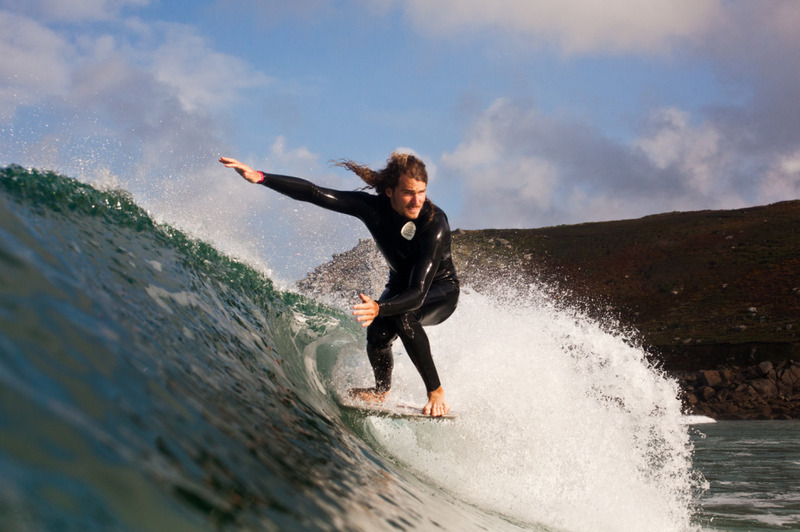 Originally from Bristol, Sam also came to Cornwall and the surf industry via Falmouth University. He too decided to stay and focus his efforts on surfing and film making. His films are clean yet nostalgic, brimming with narrative verve and set (as can be expected) to wonderful soundtracks. He makes his living as a part time tree surgeon and on commercial shoots, but his passion is the sea. 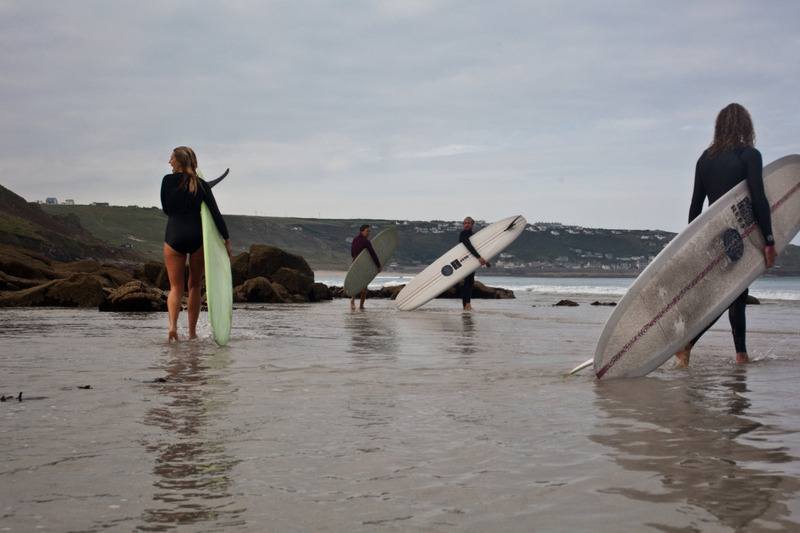 The assembled group had arrived at this stony car park atop a cliff in far west Cornwall by various paths and a variety of upbringings, but they share a common passion for surfing and for quality of life rather than monetary gain. As we walked down the long stone steps, looking up every now and again as chest high sets swung onto the spit of wet sand and spun off left and right, I couldn’t help feeling relief; a sense that we had all made the right decision. Sets were sporadic as we waded out to the peak. The long period swell was not due to fully fill in until the afternoon, and the chest high peelers that came through in between long lulls were like the scouting party – feeling out the sand, searching for favourable banks. Mitch and I split the peak on our first wave, sticking to our forehands. It felt good to share Mitch’s first wave with him. His wave riding ability is truly international in its standard. He walks to the nose with flowing motion, each cross step seamlessly linked like a musical quaver. He grew into the surf as he acclimatised to the relative cold, renewing his connection with the board that he had started with that first rub of the hand. It was as if he was remembering each stroke of the planer, why the foam had been mown in that specific way. As Mitch was reacquainting himself with his board, the sun dipped behind the clouds on the brow of the hill, shining bright like theatre lights behind a curtain that was waiting to be opened, the show about to begin. Elsie and Sarah paddled out shortly after Mitch. Elsie surfed with dramatic confidence – standing upright, eyes gazing down the line – a blend of elegance and style. As the building swell started to show, she took off late on the bigger sets, the same poise evident. Surrounded by longboarders, Sarah waited patiently for the larger waves and collided with end sections after open face speed runs. Badger smiled as the waiting sun emerged from behind the clouds. He was warm after wading from left to right trying to accommodate my goofy reluctance to surf the more consistent right handers. He was grinning manically and swearing playfully at me if he missed a good right hander whilst waiting on the left. Eventually he moved across for good. Elsie and Sarah slid by framed dramatically within a prehistoric background, the colours and curves so perfect as if they have been set in a mould and placed by the steady hand of a sculptor. On land, Sam searched for angles of his own. He scampered with surprising dexterity over the slippery rocks, his filming equipment barely slowing him down. For a couple of hours, he cropped shots close to catch the intricacies of footwork on display. He panned smoothly following surfers as naturally as eyes move in their sockets, allowing potential viewers of the footage to watch it as purely as possible. After a while, the allure of the turquoise water was too strong, and he donned wetsuit and flippers for a quick slide of his own. As we were surfing, Pia had found a quiet spot between the rocks to shoot. Originally from Germany but now living in Newquay, she waited like a hunter, snapping shots as the surfers rode to the foreground of the rocks, framing them with barnacles, limpets, and granite. She was an invisible presence on the shore, capturing the essence of the surf, not just the drama. We left the water as a team, cold and hungry, but universally happy. On that morning throughout Britain and Europe, thousands of surfers would have snuck in somewhere for a surf, reaping the rewards of a life of hard work. As a community, we surfers are creative with time and dedicated with vision. Surfing is such a powerful drug that it can cause people to make irrational decisions and strange life choices. On an everyday level, it causes arguments between the normally peaceful, makes us late for school or work, causes us to miss birthdays and weddings; the search for good waves can become so all-encompassing that exams are flunked and work neglected completely; financial security and adult independence sacrificed for a temporary high – and that’s just me. It can be hard to let a feeling go after experiencing it on a regular basis. To take a step back and dedicate oneself to surfing longevity requires discipline. The crew that morning summed it up; working together to achieve a life of surf, and defying the stereotype.